Happy Throwback Thursday! Today is the first day of the big tourney (unless you count that play-in nonsense). Here are SquadUP‘s picks for the best moments in March Madness history. Dean Smith went 20 seasons with the Tarheels without winning a national championship. Then came Michael Jordan. Down by one in the 1982 national championship game with only 17 seconds remaining, the star freshman from Wilmington, N.C. knocked down a jumper from the left wing to put UNC up by one. The ’82 tarheels never looked back. Neither did Jordan. Magic and Bird may well be the best individual rivalry to ever grace the NBA. But before either of them entered the league, they faced off in the finals of March Madness ’79. It was perfect. The flashy Ervin “Magic” Johnson was the face of the program and top dog for the Michigan State Spartans. On the other side you had the mysteriously quiet country boy, Larry Bird, who was named the national player of the year after leading his Indiana State team to a perfect 33-0. In the end it was Magic and the Spartans that stood victorious. But this game was only a precursor– a first dose of what America was about to be treated to at the highest level of basketball. The favorite in the 1983 National Championship game, Houston, was led by one of the biggest beasts to ever play college basketball: Hakeem “The Dream” Olajuwon. And he showed for the finals up in a big way winning MVP honors… in the loss. The only player ever to do so. It was Jim Valvano and NC State that snuck out a 54-52 win in the closing seconds. Dereck Whittenburg heaved up a last-second prayer that fell short of the rim, but right into the hands of Lorenzo Charles for the buzzer beating dunk. 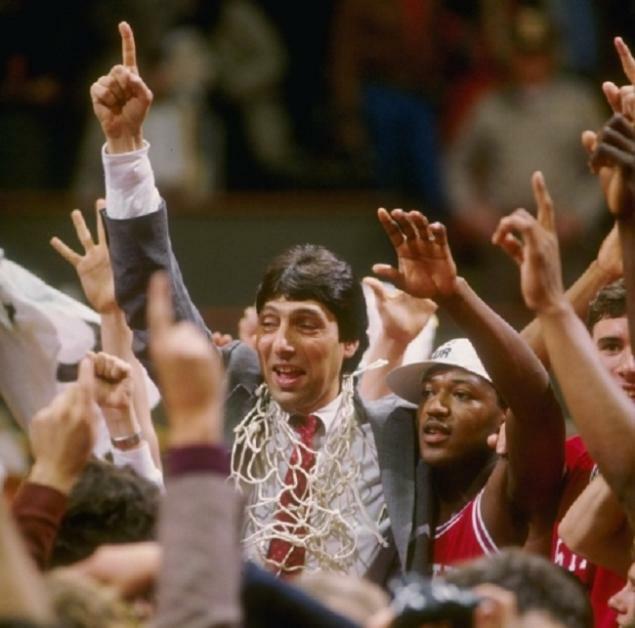 Jimmy V’s team had already earned the nickname the “Cardiac Pack” before giving the fans debatably the best moment in college basketball history. The victory haulted the 26-game winning streak of Houston’s renowned Phi Slama Jama, a team that was expected to walk over the Wolfpack with ease. Hope you remembered to fill out your brackets. Fannetic and Sumeria have teamed up to bring you awesome March Madness watch parties. Check it out!